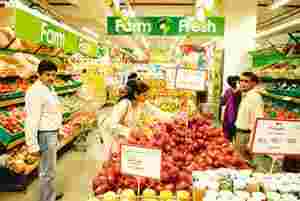 Mumbai: Aggressive pricing by India’s organized retailers on staples such as rice, pulses, sugar and vegetables have helped attract new consumers and boost volume sales, amid food price inflation rocketing to an 11-year-high for the week ended 28 November. “Despite the rising value of staples, we are seeing a growth in volumes (number of units sold). This could mean that there is no cutback in consumer spends or that whilst there is a cutback, the number of people visiting the store is higher and therefore volumes are higher," says Thomas Verghese, chief executive officer, Aditya Birla Retail Ltd, which runs More, a supermarket and hypermarket format retail chain. According to financial data provider Bloomberg, India’s wholesale food prices rose at their fastest pace in 11 years to 19.05% for the week ended 28 November from the previous year, following a 17.47% gain in the previous week. The increase in food costs is largely on account of lower farm output following a weak monsoon. Key items have surged in October from a year ago—onions are 45% costlier, potatoes have risen 97.73%, pulses by 23%, food grains by 13% and sugar by over 45%. Staples, fruit and vegetables account for as much as 35% of the average bill at a supermarket and at least 20% in a hypermarket, says D.V. Ramkumar, vice-president (food and agri) at Spencers Retail Ltd, a division of RPG Enterprise. Additionally, retailers are beginning to stock more private labels over national brands, and the results are showing. “The sale of private labels have grown by over 16% to 18% over a year ago as people are buying cheaper products and private labels are at least 10% to 20% cheaper than the national brands," says Ashutosh Chakradeo, business head, food and grocery, HyperCITY Retail India Ltd, a part of K. Raheja Corp., which also owns Shopper’s Stop Ltd. However, he concedes that buyers are shopping smaller quantities of vegetables and cutting back on fruit consumption. At Spencers, which has 230 super market stores and 25 hypermarket retail stores nationwide, the “average bill value has increased 5-6% month-on-month for the last three months even as volumes declined by close to 3%," Ramkumar of Spencers told Mint. While some of this is inflationary, Ramkumar says that some real growth is also happening as the price of oil has dropped in the last five months even as staples and vegetables increased. “Oil accounts for 35-38% (of the) value of consumers’ staples bill," he said. Consumers are also beginning to take notice of price discrepancies and value offerings. Nisha Manwani, a homemaker whose husband is an investment consultant, shops at D-Mart for groceries and buys vegetables at Spencers even though she stays closer to HyperCITY. “The savings is not much at Rs30-Rs40. But on a monthly bill of Rs3,000-Rs4,000 it is 10%." While HyperCITY and Spencers are in adjoining buildings, D-Mart is about 2km away. “Retailers have become more aggressive in benchmarking the key value items (KVIs) like potatoes, onions, tomatoes, oil, sugar as these are tracked by housewives on a daily basis," says Debashish Mukherjee, principal, A.T. Kearney India. “We can see an amplified level of communications surrounding these KVIs in the last few months,"
“With growing food inflation, our communication is focused on offering our consumers better value for the basic commodities," says Damodar Mall, chief executive officer (incubation and innovation), Future Group, which owns the Big Bazaar and Food Bazaar chains. “The consumer franchise is growing as people from the lower-income bracket are aspiring to move up the value chain and frequenting the modern retail format as they look for cereals." Meanwhile, consumers are increasing the basket of items they track as part of their ongoing search for the best deal. “I no longer experiment with my shopping basket and just buy the basics after looking at value savings across retailers," says Shilpa Devra, a resident of the Mumbai suburb of Goregaon who has started buying smaller quantities and has increased her visits to organized retail stores to up to four times a month in search of bargains.